What with the Ashes being a let down, the One Day Internationals more interminable than ever and Federer just too bloody good, the serious student of TV sport has been shamefully sabotaged this summer. There was beach cricket, of course, but don’t start me on that. 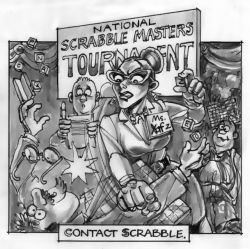 Then suddenly, bereft, contemplating alcoholic comfort, and idly browsing, I came across a flyer for the National Scrabble Masters Tournament. Interested as always in the arcane, I sought out the Tournament organiser, a woman who, according to the website, was called Ann Smith, but who told me when we met that she’d changed her name to Ann Xafz [giving her a basic score of 23 but a blinding 69 on a triple word spot in those games where you’re allowed to use your surname]. I naturally deferred to this adjustment and thereafter endangered the wellbeing of my larynx by twisting it round the labyrinthine corners posed by the words ‘Ms Xafz’. "Well, Ms Xafz," I began, "tell me about the tournament. 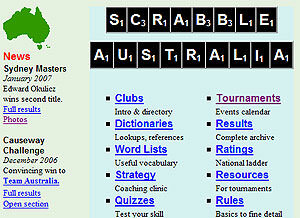 Do you have Scrabble enthusiasts coming here from all over the world?" "Oh, indubitably," [24 with triple word score on the ‘b’] she said, "And just while we’re on that, I’d like to point out that there are 109 two-letter words in the English language. Twenty-seven of these are familiar, like 'it', 'in' and 'to', but among the eighty-two others are incantations, (Om), mathematical symbols, (Pi), and various contractions that can be highly controversial if deployed [basic score of fifteen but go for triple letter score on the 'y'] in competition." "I suppose," I probed, "that for an audience, Scrabble is a bit like Chess – long periods of silent concentration, the drama of waiting." "Well, I don’t think Scrabblers see much drama in waiting," she speculated. "The best players tend to be aggressive about slow opponents. If time wasting is suspected, what is known as the Rintoul-Bollock manoeuvre is sometimes employed in tense finals competition." "The Rintoul-Bollock manoeuvre being …"
Ms Xazf gave me a pitying look. It appears that a player named Thelonius Rintoul-Bollock, the Republic of Vultava’s sole international standard Scrabbler, was in sight of victory in the 1968 Scrabble Scramble at Scunthorpe, when his opponent attempted to run a word across Rintoul-Bollock’s 'zizmathoid' [48 with double-word scores on the first 'z' and the ‘d’]. This bloke apparently hesitated for long minutes until Thelonius initiated the ploy that bears his name, which was to lean across the board and belt him on the nose. The board became sanguineous [36 on triple word spot], but Rintoul-Bollock was disqualified anyway because of a dispute about the authenticity of the word “zizmathoid”. He maintained that it was a medical condition in which the sufferer imagined he or she had turned into a musical instrument – usually a zither. The judges disagreed. 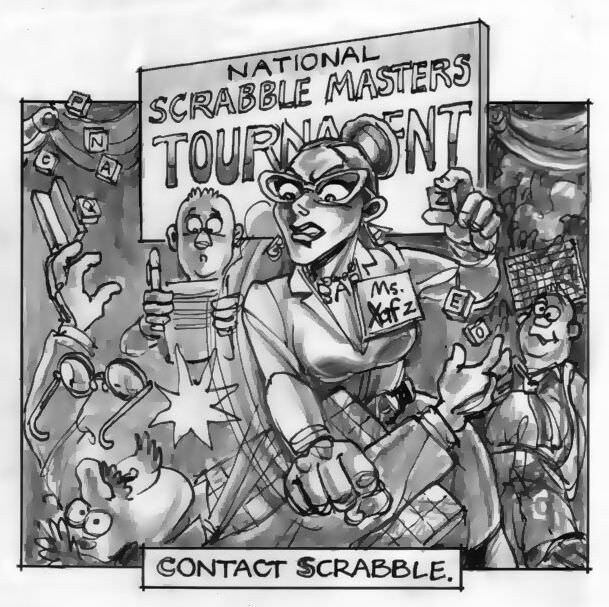 "Would you say Scrabble is ordinarily a contact sport?" "Rintoul-Bollock", she retorted doggedly, "also contributed to the game’s development, pointing out that the suffix ‘-oid’ is a particularly useful and productive tool. For example – "
"You mean, as in, 'Oid prefer to read a book'", I suggested, relieved to be able to make a contribution.
" – humanoid, mucinoid, actinoid, petaloid, factoid, plasmoid", intoned Ms Xazf, her suddenly glazed and popping eyes proclaiming perhaps a malfunctioning thyroid. "Haemorrhoid?" I suggested, pleased to be in the spirit of things, but Ms Smarty-69-triple-word-score came over all genteel on me, objecting to obscene or 'doubtful' words in competition. "There must be some great anecdotes to emerge from the clashes of Scrabblers at the elite level?" I adumbrated. An expression of intense boredom suffused her features which, I had already noticed, had a sort of chiselled, focused cast to them, honed no doubt by hours poised over the board with a head full of alphabet and mathematics – letters to make mettlesome words, mathematics to calculate complicated triples and doubles and to check on your opponent’s almost certainly faulty powers of addition and multiplication. But in answer to my musing [unobtrusive but a useful 15 with a triple on the 'm'], she simply proclaimed, "What is much more interesting is the fact that there are many other productive and classic suffixes, such as '-mata’". "As in 'tomata'," I ventured, reasoning that Scrabble should not be without its moments of humour and flightiness. "Stigmata, traumata, dogmata, miasmata, zygomata", enunciated Ms Xazf. She was, I concluded, agreeing with me in a merry way. Though possibly not – these Scrabblistes play their tiles pretty close to the chest except when employing the Rintoul-Bollock strategy. All in all, I felt that my flawed interviewing technique had somehow caused me to miss the visceral, controversial and heart-stopping cut-and-thrust of international Scrabble. I wished Ms Xazf all the best and set off to find a calming ale [meagre basic score of 3, but a marvellous little connector]. What a humdinger of a piece! Well done Brian M! Comprehensively drawn characters demonstrate that guilt has a way of catching up with people, forcing them to make a clear choice regarding where they will seek long-term happiness. In the 1990s, Soeharto and his ministers were renting their power to business-savvy ethnic Chinese. The masses, unable to vent their anger at corrupt officials, shifted their targets to those associated with them, knowing that they could do that with impunity.